The recipe for veggie balls is similar to my Okoy recipe here. Shredded squash, sweet potatoes (kamote) (shredded), malunggay, eggs (beaten), flour, salt to taste, pepper, oil for frying. 1. In a bowl, mix all the ingredients – shredded squash, sweet potatoes, malunggay, onion, beaten eggs, flour, salt, and pepper – form them into balls. 2. Heat moderate amount of cooking oil in the pan. 3. Put the veggie balls mixture. 4. Fry for about 2 to 3 minutes or until golden brown. 5. Drain the excess oil on paper towel and you’re done. Kids will also love this for snack. You’ll need vinegar, soy sauce, onion, red chilli, pepper, sugar. 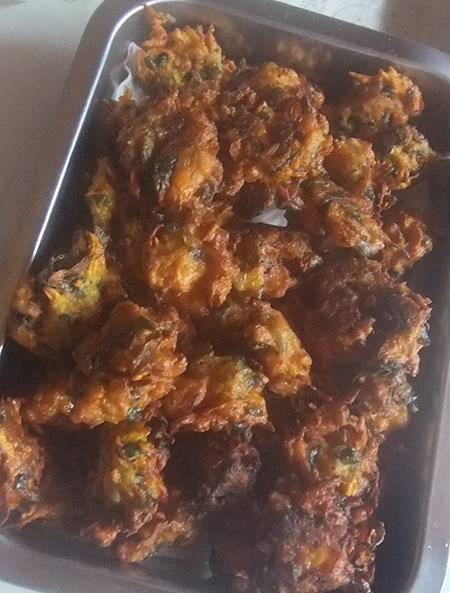 This entry was posted in Favorite Food, Recipe, Snacks and tagged fried squash balls, fried veggie balls, squash balls, veggie balls on August 11, 2013 by Yami.